Benko Products' heavy-duty tracking gangways provide smoother operations for tank truck and railcar loading applications. The loading racks are part of the "GREEN Access Fall Protection" line and are designed with ease of installation in mind, and are engineered in compliance with Occupational Health and Safety Association (OSHA) standards. Standard finish is red oxide primer. Optional coatings and hot-dipped galvanizing are available. GREEN Access Fall Protection has the ability to custom-build bulk loading systems to meet specific application needs and features over 150 years of engineering experience. For over 40 years, GREEN Access & Fall Protection has been the trusted leader in safety equipment, designing and building the most reliable, durable and affordable access and fall protection equipment for tank trucks and rail cars. 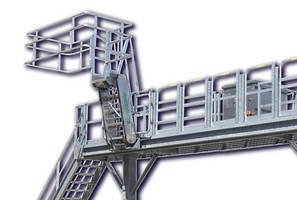 GREEN Access & Fall Protection's line includes gangways, loading racks, stationary and portable platforms, large tank truck and rail car loading systems, horizontal lifeline systems and caged ladders. The G-RAFF elevating tank truck platform is also part of the GREEN Access & Fall Protection family of safety solutions. GREEN Access & Fall Protection is manufactured by Benko Products, Inc. in its state-of-the-art facility in Sheffield Village, OH.